As the following graph shows, the price of shares in Canadian Pacific Railway Limited (CP) has just fallen below its 13 and 34-day moving averages and appears to be stabilizing at around $240. The graphs also show that the stochastic oscillator (the bottom graph) is clearly trending downward. Even though the stock may rally, it may also be contained below $250, and the $230 to $235 range could represent a significant support zone. An investor who agrees with this scenario could write call options for each 100 shares of CP held in order to take advantage of the time decay that could result from CP’s relative stability under the $250 level. To this end, the investor could write call options expiring in August with a strike of $250. However, if the price of CP rises significantly above $250, the ability to profit from this situation would be lost. Consequently, the investor could purchase call options with a $260 strike in order to avoid being left out if the stock price rises. The combination of writing call options with a $250 strike and purchasing call options with a $260 strike produces what is called a bear spread. Writing the call option CP 180817 C 250 at $3.10 per share generates $310 in cash, and buying the call option CP 180817 C 260 at $1.25 per share costs $125. The $185 net credit represents the maximum profit on the bear spread, which will be realized if CP is trading at or below the $250 strike on expiration of the options on August 17, 2018. By combining the bear spread with holding 100 shares of CP, we obtain a bear spread hedge, which has the profit and loss profile shown above. 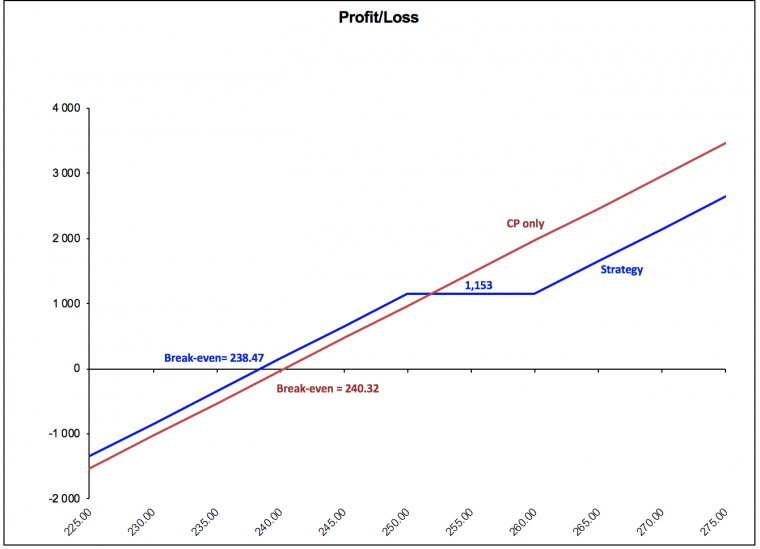 The credit of $1.85 per share effectively lowers the breakeven price to $238.47 ($240.32 – $1.85). It is from this level that the position becomes a losing proposition if the stock price falls significantly. If the price rises, it is a winning position with a potential profit of $1,153 between the two strikes of $250 and $260, and it generates unlimited profit above $260. This strategy may need to be managed somewhat, based on the price of CP upon expiration of the options on August 17, 2018. If CP is trading at below the $250 strike, then no intervention is required. Should it be trading at above $250 but below $260, then the call option CP 180817 C 250 will be exercised by its holder and the investor will receive an assignment notification that forces sale of the shares at the price of $250. To avoid losing the shares, the investor will need to buy back the call options written before they expire. If the price of CP rises above $260, the investor will then be assigned the call option CP 180817 C 250 and forced to sell the shares at $250 each. However, the call option CP 180817 C 260 will automatically be exercised and the investor will recover the shares by buying them at the $260 strike price. To avoid these purchases and sales related to the call option exercise and assignment, the call option written can simply be bought back and the call option held can be resold before expiration. Good luck with your trading, and have a good week! *The breakeven price and the projected profits and losses are only estimates developed on the basis of the presumed value of the put options expiring on August 18th, 2018. The strategies presented in this blog are for information and training purposes only, and should not be interpreted as recommendations to buy or sell any security. As always, you should ensure that you are comfortable with the proposed scenarios and ready to assume all the risks before implementing an option strategy. The post Setting up a bear call spread hedge using call options appeared first on Option Matters. Fast Million Scam Review – Read and Beware!